A view down Cooper's Hill, from the start point of the race to the finish (where the dog-walkers are). The face of the hill itself is concave, and hence cannot be seen from this angle. The posts at the bottom are signs from the local council requesting that, to avoid soil erosion, people do not walk on the face of the hill. The posts are removed for the annual event. The Cooper's Hill Cheese-Rolling and Wake is an annual event held on the Spring Bank Holiday at Cooper's Hill, near Gloucester in England. It was traditionally held by and for the people who live in the local village of Brockworth, Gloucestershire, but now people from all over the world take part. The Guardian newspaper called it a "world-famous event", with winners from the United States, Australia, New Zealand and Nepal. The event is traditional and takes its name from the steep hill on which it occurs. Until recent years, it was managed in a quasi-official manner by nominated locals, but since 2010 the event has taken place spontaneously without any management. From the top of the hill, a 7–9 pounds (3.2–4.1 kilograms) round of Double Gloucester cheese is sent rolling down the hill, and competitors then start racing down the hill after it. The first person over the finish line at the bottom of the hill wins the cheese. The competitors are aiming to catch the cheese; however, it has around a one-second head start and can reach speeds up to 70 miles per hour (110 kilometres per hour), enough to knock over and injure a spectator. In the 2013 competition, a foam replica replaced the cheese for reasons of safety. The winner was given the prize of an actual cheese after the competition. The Cheese Rollers pub in the nearby village of Shurdington, about 3 miles (5 kilometres) from Cooper's Hill, takes its name from the event. This ceremony originally took place each Whit Monday, before it later transferred to the Spring Bank Holiday. Two possible origins have been proposed for the ceremony. The first is said that it evolved from a requirement for maintaining grazing rights on the common. The second proposal is pagan origins for the custom of rolling objects down the hill. It is thought that bundles of burning brushwood were rolled down the hill to represent the birth of the New Year after winter. Connected with this belief is the traditional scattering of buns, biscuits and sweets at the top of the hill by the Master of Ceremonies. This is said to be a fertility rite to encourage the fruits of harvest. The first written evidence of cheese rolling is found from a message written to the Gloucester town crier in 1826, though even then it was apparent the event was an old tradition. Each year, the event becomes more and more popular, with contestants coming from all across the world to compete, or even simply to watch. In 1993, fifteen people were injured, four seriously, chasing cheeses down the one-in-three hill. On 24 March 2010, the organisers faced a backlash following an announcement of how the 2011 event would be run. The plans had been made to conduct the event under mounting pressure from the local council, who stipulated it should include security, perimeter fencing to allow crowd control, and spectator areas that would charge an entrance fee. The event proceeded without management. No-one's going to stop us doing it. They say it's not official, but we are all Brockworth people, and we're running the cheese today, so it is official. We strongly believe in it. —  Former winner Helen Thorpe in May 2011. Since we announced an entry fee, we have been bombarded with so much hostility and criticism, much of it at a personal level, including accusations of profiteering, and some of the committee have even received threats. —  Cheese Rolling Committee spokesman Richard Jefferies speaking in March 2011. The 2011 event took place without management, due to safety concerns over the number of people visiting the event, resulting in the 'Save the Cheese Roll' campaign. Despite the cancellation and lack of paramedics, around 500 people showed up in 2011 to hold some spontaneous races; no major injuries were reported. The cheese currently used in the event is 7–9 pounds (3.2–4.1 kilograms) Double Gloucester, a hard cheese traditionally made in a circular shape. Each is protected for the rolling by a wooden casing round the side, and is decorated with ribbons at the start of the race. Formerly, three cheeses were presented by parishioners, and the cheeses were usually rolled by them. A collection is usually made now to purchase them, as well as sweets, and also to provide prize money. The current supplier is local cheesemaker Diana Smart and her son Rod, who have supplied the cheese since 1988. In May 2013, a police inspector warned the 86-year-old cheese maker Diana Smart that she could be held responsible for injuries. Chief Superintendent Nigel Avron of Gloucestershire Police also made these comments: "If you are an organiser in some way or some capacity you could potentially be held liable for something that took place at that event". In recent years, organisers of the event, have felt compelled to use a lightweight foam version for safety reasons. In the second race (2013) Australian Caleb Stalder managed to catch the fake cheese and claim victory, despite being some way behind the leaders. Due to the steepness and uneven surface of Cooper's Hill, there are usually a number of injuries each year. A first aid service is provided by the local St John Ambulance (Gloucester, Cheltenham and Stroud Divisions) at the bottom of the hill. Members of the local rugby club and Young Farmers volunteer their services by acting as 'catchers' for any participants who lose their balance and also are on hand to carry down any casualties requiring first aid who do not reach the bottom. A number of ambulance vehicles attend the event, since there is invariably at least one and often several injuries requiring hospital treatment. As the event has evolved, an additional on-site professional medical cover is provided by another group of volunteers: 'Search And Rescue Aid In Disaster' (SARAID). Cooper's Hill Cheese Rolling has been summarised by a previous participant as "twenty young men chasing a cheese off a cliff and tumbling 200 yards to the bottom, where they are scraped up by paramedics and packed off to hospital". This quotation was reported in The Sydney Morning Herald newspaper of 13 November 2008, in an amusingly titled article 'Return to Edam'. The same article reports one Scottish competitor prodding another in the ribs at the top of the hill, quizzing him if his "travel insurance cover[s] this"? The Australian author, Sam Vincent, "questions his sanity" as he is "crouched on the summit of a diabolical slope", alongside thirteen other competitors whilst they are "awaiting the call to start what is surely the world's most dangerous footrace". The notoriety of cheese rolling is widespread and its somewhat de facto tally of annual injuries has been the subject of much coverage in news and television programmes. Alongside reputable broadcasters such as the BBC Television reporting, the global sports magazine TV shows Gillette World Sport and Trans World Sport have both mused at the barmy activities and the ensuing injuries for many years. Chris Anderson 22,Steve gyde 21, Steve Brain 18, Izzy (Islwyn) John 13, Ryan Fairley 5, Aaron Walden 3, Jason Crowther 3, Craig Fairley 3, Craig Brown 2. Rosemary Cooke 3 (1953, 1955, 1956), Amanda Turner 3 (1981, 1982, 1983), Dionne Carter 3 (2004, 2005, 2006), Lucy Townsend 3 (2012, 2013, 2014), Flo Early 3 (2008, 2016, 2018), Kirsty Shepherd 2 (2000, 2002), Keavy Morgan 2 (2015, 2017). The second race in the 2004 event was won by New Zealand television personality and former international rugby player Marc Ellis. In 2018, soldier with 1st Battalion, The Rifles (1 Rifles), 30 year old Chris Anderson broke the all-time record of 22 wins in the men's races. 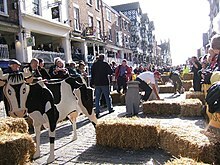 An annual cheese-rolling event has taken place in Chester since about 2002, to promote the town's food and drink festival. The rolling takes place on the flat down an obstacle course. No injuries have been reported since 2006. A children's computer game from Neopets named "Cheeseroller", involves different varieties of outlandish cheeses, rolled down a 120-metre hill in under 60 seconds, negotiating obstacles on route. Points are awarded for grade of cheese difficulty and speed of descent. Cheese rolling was prominently featured in the first episode of the UK television channel Five series: Rory & Paddy's Great British Adventure, broadcast on 13 August 2008, and was described as "the grandaddy of weird sports" by the titular Rory McGrath and Paddy McGuinness. Cheese rolling appeared in the television series ER, Season 14 Episode 8, "Coming Home", where a motley bunch of cheese rolling enthusiasts (with accents of dubious accuracy) have a dispute, allowing Morris to demonstrate the Judgment of Solomon. Cheese rolling footage from SoGlos was used in Off the Air at the end of the series premier episode "Animals". The NPR news quiz show Wait Wait... Don't Tell Me featured cheese-rolling in a 'Not My Job' segment with skier Mikaela Shiffrin. Cheese rolling is mentioned in the acclaimed Thomas Pynchon novel Mason & Dixon. Logan mentions cheese rolling in Gloucester in the TV series Gilmore Girls. The contest was the subject of the BBC One programme The Great Cheese Chase broadcast in 2018. ^ a b c "Cheese Rolling". BBC Gloucestershire. 30 May 2005. Archived from the original on 31 May 2013. Retrieved 31 May 2013. .
^ a b c "American flies in to win Gloucestershire cheese rolling contest". TheGuardian.com. The Guardian. 27 May 2013. Archived from the original on 24 July 2013. ^ a b c d "Coopers Hill cheese-rolling fans hold unofficial race". www.BBC.co.uk. BBC News online. 31 May 2011. Retrieved 31 May 2011. ^ a b c d e "Cheese-maker warned against supplying Gloucester cheese-rolling". www.BBC.co.uk. BBC News Online. 24 May 2013. ^ a b c d Anon. "Cheese Rolling on Coopers Hill, Exhibition", Gloucester City and Folk Museums, Gloucester, 14 July 2012. ^ "Cheese Rolling: A brief history". BBC. 13 November 1994. Retrieved 30 May 2018. ^ "Gloucestershire cheese-rolling off due to safety fears". news.BBC.co.uk. BBC News. 12 March 2010. Retrieved 30 April 2010. ^ "Save the Gloucestershire Cheese Rolling campaign launched". www.SoGlos.com. 13 January 2011. Retrieved 3 July 2016. ^ Farley, Christopher (1 January 2001). "Save the Gloucestershire Cheese Rolling campaign launched". www.SoGlos.com. Archived from the original on 31 May 2013. Retrieved 3 July 2016. ^ "Double Gloucester". www.BritishCheese.com. British Cheese Board. 2013. Archived from the original on 26 July 2011. Retrieved 31 May 2013. ^ a b "More Cheese Rolling facts and information". Cheese-Rolling.co.uk. Archived from the original on 31 May 2013. Retrieved 20 October 2017. ^ a b "Gloucestershire cheese-rolling takes place despite warning". BBC News. 27 May 2013. ^ a b c "Cheese-chasing champion retires injured after fifth Gloucestershire win". The Telegraph. 2009. ^ a b c d Quoted in "Return to edam". www.SMH.com.au. The Sydney Morning Herald. 13 November 2008. Archived from the original on 31 May 2013. ^ "Race results 1995 events". newspapers.com. 1995. ^ "Race results 1996 events". Cheese-Rolling.co.uk. 1996. ^ "Race results 1997 events". Cheese-Rolling.co.uk. 1997. ^ "Cheese rolling festival takes dangerous turn". CNN. 1997. ^ "Race results 1998 events". Cheese-Rolling.co.uk. 1998. ^ "Race results 1999 events". Cheese-Rolling.co.uk. 1999. ^ "Race results 2000 events". Cheese-Rolling.co.uk. 2000. ^ "Race results 2001 events". Cheese-Rolling.co.uk. 2001. ^ "Fallen cheese-roller (Craig Brown) calls it a day". bbc.co.uk. 2002. ^ "Earthquake halts cheese rolling races 2003". bbc.co.uk. 2003. ^ a b "Falling down hills: Ellis takes the big cheese". www.NZHerald.co.nz. The New Zealand Herald. 2 June 2004. Retrieved 10 May 2017. ^ "Chasing the Big Cheese 2004". bbc.co.uk. 2004. ^ "Chasing the cheese in 2005". bbc.co.uk. 2005. ^ "Cheese Rollercoaster -The world famous Cooper's Hill Cheese Rolling returned with a bang for 2006". bbc.co.uk. 2006. ^ "Cheese Rolling 2007". bbc.co.uk. 2007. ^ a b "Gloucestershire Cheese Rolling 2008 review". soglos.com. 2008. ^ "Cooper's Hill Cheese-Rolling 2009". archive.boston.com. 2009. ^ "Cheese Rolling 2009". bbc.co.uk. 2009. ^ "Hundreds defy cheese rolling ban". The Telegraph. 2010. ^ "Coopers Hill cheese-rolling fans hold unofficial race 2011". bbc.co.uk. 2011. ^ "2011 Chris Anderson, 23, from Brockworth, holds all three cheeses he won today". heart.co.uk. 2011. ^ ""I don't even like cheese"". Mirror.co.uk. 2012. ^ "American Wins Annual Cooper's Hill Cheese-Rolling Race". BBC America. 2013. ^ "They're Gouda control!". dailymail.co.uk. 2014. ^ "Gloucestershire cheese race winner finds himself in a pickle". theguardian.com. 2014. ^ "Thousands watch Gloucestershire cheese rolling races". bbc.co.uk. 2015. ^ "Gloucestershire Cheese Rolling 2016 - the tumbles". YouTube. 2016. ^ "Cheese-Rolling at Cooper's Hill 2016". Cheese-Rolling.co.uk. 2016. ^ "Champion chaser who hates cheese wins for the 17th time". Evening standard. 2016. ^ a b c "Gloucester cheese-rolling veteran breaks all-time record". www.BBC.co.uk. BBC News. 2018. ^ a b "Champion competitors Roll of Honour". Cheese-Rolling.co.uk. 2017. ^ "Gloucestershire cheese race winner is the all-time grate". theguardian.com. 2018. ^ "Cheese Rolling 2018 - all the pictures from Cooper's Hill". gloucestershirelive.co.uk. 2018. ^ "Cheese Rolling, Coopers Hill 2018 - all the pictures Photo 60 of 61". gloucestershirelive.co.uk. 2018. ^ "Cheese rolling in Chester". www.BBC.co.uk. BBC Liverpool. 15 March 2006. ^ "Not My Job: skier Mikaela Shiffrin gets quizzed on downhill cheese races". www.NPR.org. 11 July 2014. Retrieved 3 July 2016. ^ "The Great Cheese Chase - BBC One". BBC. Retrieved 6 August 2018. 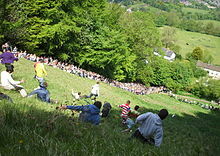 Wikimedia Commons has media related to Cheeserolling.